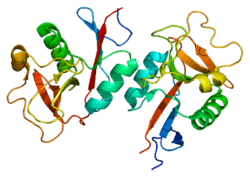 C-type lectin domain family 4 member M is a protein that in humans is encoded by the CLEC4M gene. CLEC4M has also been designated as CD299 (cluster of differentiation 299). This gene encodes L-SIGN (liver/lymph node-specific intracellular adhesion molecules-3 grabbing non-integrin), a type II integral membrane protein that is 77% identical to CD209 antigen, an HIV gp120-binding protein. This protein, like CD209, efficiently binds both intercellular adhesion molecule 3 (ICAM3) and HIV-1 gp120, and enhances HIV-1 infection of T cells. This gene is mapped to 19p13.3, in a cluster with the CD209 and CD23/FCER2 genes. Multiple alternatively spliced transcript variants have been found for this gene, but the biological validity of some variants has not been determined. ↑ Yokoyama-Kobayashi M, Yamaguchi T, Sekine S, Kato S (Apr 1999). "Selection of cDNAs encoding putative type II membrane proteins on the cell surface from a human full-length cDNA bank". Gene. 228 (1-2): 161–7. doi:10.1016/S0378-1119(99)00004-9. PMID 10072769. ↑ "Entrez Gene: CLEC4M C-type lectin domain family 4, member M". Baribaud F, Doms RW, Pöhlmann S (2006). "The role of DC-SIGN and DC-SIGNR in HIV and Ebola virus infection: can potential therapeutics block virus transmission and dissemination?". Expert Opin. Ther. Targets. 6 (4): 423–31. doi:10.1517/14728222.6.4.423. PMID 12223058. Becker Y (2004). "HIV-1 gp120 binding to dendritic cell receptors mobilize the virus to the lymph nodes, but the induced IL-4 synthesis by FcepsilonRI+ hematopoietic cells damages the adaptive immunity--a review, hypothesis, and implications.". Virus Genes. 29 (1): 147–65. doi:10.1023/B:VIRU.0000032797.43537.d3. PMID 15215692. Lalor PF, Lai WK, Curbishley SM, et al. (2006). "Human hepatic sinusoidal endothelial cells can be distinguished by expression of phenotypic markers related to their specialised functions in vivo.". World J. Gastroenterol. 12 (34): 5429–39. PMID 17006978. Curtis BM, Scharnowske S, Watson AJ (1992). "Sequence and expression of a membrane-associated C-type lectin that exhibits CD4-independent binding of human immunodeficiency virus envelope glycoprotein gp120.". Proc. Natl. Acad. Sci. U.S.A. 89 (17): 8356–60. doi:10.1073/pnas.89.17.8356. PMC 49917 . PMID 1518869. Gattegno L, Ramdani A, Jouault T, et al. (1992). "Lectin-carbohydrate interactions and infectivity of human immunodeficiency virus type 1 (HIV-1).". AIDS Res. Hum. Retroviruses. 8 (1): 27–37. doi:10.1089/aid.1992.8.27. PMID 1736938. Soilleux EJ, Barten R, Trowsdale J (2000). "DC-SIGN; a related gene, DC-SIGNR; and CD23 form a cluster on 19p13.". J. Immunol. 165 (6): 2937–42. doi:10.4049/jimmunol.165.6.2937. PMID 10975799. Pöhlmann S, Soilleux EJ, Baribaud F, et al. (2001). "DC-SIGNR, a DC-SIGN homologue expressed in endothelial cells, binds to human and simian immunodeficiency viruses and activates infection in trans.". Proc. Natl. Acad. Sci. U.S.A. 98 (5): 2670–5. doi:10.1073/pnas.051631398. PMC 30196 . PMID 11226297. Bashirova AA, Geijtenbeek TB, van Duijnhoven GC, et al. (2001). "A dendritic cell-specific intercellular adhesion molecule 3-grabbing nonintegrin (DC-SIGN)-related protein is highly expressed on human liver sinusoidal endothelial cells and promotes HIV-1 infection.". J. Exp. Med. 193 (6): 671–8. doi:10.1084/jem.193.6.671. PMC 2193415 . PMID 11257134. Mummidi S, Catano G, Lam L, et al. (2001). "Extensive repertoire of membrane-bound and soluble dendritic cell-specific ICAM-3-grabbing nonintegrin 1 (DC-SIGN1) and DC-SIGN2 isoforms. Inter-individual variation in expression of DC-SIGN transcripts.". J. Biol. Chem. 276 (35): 33196–212. doi:10.1074/jbc.M009807200. PMID 11337487. Mitchell DA, Fadden AJ, Drickamer K (2001). "A novel mechanism of carbohydrate recognition by the C-type lectins DC-SIGN and DC-SIGNR. Subunit organization and binding to multivalent ligands.". J. Biol. Chem. 276 (31): 28939–45. doi:10.1074/jbc.M104565200. PMID 11384997. Feinberg H, Mitchell DA, Drickamer K, Weis WI (2002). "Structural basis for selective recognition of oligosaccharides by DC-SIGN and DC-SIGNR.". Science. 294 (5549): 2163–6. doi:10.1126/science.1066371. PMID 11739956. Alvarez CP, Lasala F, Carrillo J, et al. (2002). "C-type lectins DC-SIGN and L-SIGN mediate cellular entry by Ebola virus in cis and in trans.". J. Virol. 76 (13): 6841–4. doi:10.1128/JVI.76.13.6841-6844.2002. PMC 136246 . PMID 12050398. Soilleux EJ, Morris LS, Rushbrook S, et al. (2002). "Expression of human immunodeficiency virus (HIV)-binding lectin DC-SIGNR: Consequences for HIV infection and immunity.". Hum. Pathol. 33 (6): 652–9. doi:10.1053/hupa.2002.124036. PMID 12152166. Lin G, Simmons G, Pöhlmann S, et al. (2003). "Differential N-linked glycosylation of human immunodeficiency virus and Ebola virus envelope glycoproteins modulates interactions with DC-SIGN and DC-SIGNR.". J. Virol. 77 (2): 1337–46. doi:10.1128/JVI.77.2.1337-1346.2003. PMC 140807 . PMID 12502850. Pöhlmann S, Zhang J, Baribaud F, et al. (2003). "Hepatitis C virus glycoproteins interact with DC-SIGN and DC-SIGNR.". J. Virol. 77 (7): 4070–80. doi:10.1128/JVI.77.7.4070-4080.2003. PMC 150620 . PMID 12634366. Engering A, van Vliet SJ, Hebeda K, et al. (2004). "Dynamic populations of dendritic cell-specific ICAM-3 grabbing nonintegrin-positive immature dendritic cells and liver/lymph node-specific ICAM-3 grabbing nonintegrin-positive endothelial cells in the outer zones of the paracortex of human lymph nodes.". Am. J. Pathol. 164 (5): 1587–95. doi:10.1016/S0002-9440(10)63717-0. PMC 1615649 . PMID 15111305. 1sl6: Crystal Structure of a fragment of DC-SIGNR (containing the carbohydrate recognition domain and two repeats of the neck) complexed with Lewis-x. 1xar: Crystal Structure of a fragment of DC-SIGNR (containing the carbohydrate recognition domain and two repeats of the neck). CLEC4M human gene location in the UCSC Genome Browser. CLEC4M human gene details in the UCSC Genome Browser.